With only a thin French presence and little population or land pressure, the cause of nationalism never aroused among the easygoing Lao the fervor that it did in Vietnam. But there were among upper class Lao, notably Prince Souphanouvang and the half-Vietnamese Kaysone Phomivihan, some who were attracted to left-wing ideas and who were to ally with the Vietnamese communists. They were among the Lao Issara nationalists who tried to prevent the return of the French in 1945. Tran Van Dinh, one of the Vietnamese escorts for Prince Souphanouvang when he travelled from Hanoi to Vientiane in October 1945, described in an account how the Prince ordered his Vietnamese guards to remove the Viet Minh red star on a gold background and replace it with the Lao insignia of a white three headed elephant on a red background. Souphanouvang himself was wounded by a strafing British Spitfire as the Lao Issara movement was not able to withstand the French return. In 1950 the First Resistance Congress of Laos was convened by the Prince in Hanoi, proclaiming on August 13 the Neo Lao Issara (Lao Freedom Front) and organizing a National Resistance Government which was to work with the Viet Minh in the eastern provinces of Laos. After the Indochina Communist Party was officially replaced by the Vietnamese Workers Party in 1951, an ostensibly separate Laotian party was organized and announced later as the People's Party of Laos (Phak Pasason Lao). This "leading force for revolution," however, was kept in a semi-secret status and dealt with by foreign communist parties with a protocol of discretion. Instead, use was made of an open, broad political organization established January 6, 1956, and called the Lao Patriotic Front (Neo Lao Hak Hat). Generally, however, the Lao communists were called by the name Pathet Lao (Country of the Lao). In 1957 Prince Souphanouvang reached an agreement with his half-brother, Prince Souvanna Phouma, for a Government of National Reconciliation. The Lao Patriotic Front were to be allowed to contest the elections held in 1958; the Pathet Lao dominated provinces of Sam Neua and Phong Saly would be absorbed into the national government; and some 1500 (of an estimated 6000) Pathet Lao soldiers would be absorbed as two battalions of the Royal Lao Army. But in the elections the well organized Pathet Lao and allied Santiphab Party won 13 out of 21 contested seats, and the conservatives grew increasingly worried. After the breakdown of negotiations, Prime Minister Phoui Sanaikone arrested the Pathet Lao leaders in Vientiane and detained the two Pathet Lao original battalions. Subsequently, both the leaders and the battalions successfully fled. After the Central Committee meeting of the Vietnamese Workers Party of May 1959 which decided to accelerate the effort in the south, the decision was also made to assist the Pathet Lao more heavily. "Vietnamese People's Volunteer Forces" thus heavily entered Laos both in the northeast and, to secure the trail network, in the south. After the Kong Le coup in August 1960 and the reconvened Geneva Conference in May 1961, the Pathet Lao along with "neutrals" participated in a tripartite government in Vientiane. As this again disintegrated, the Pathet Lao in 1963 once more left for the maquis to continue their government in the caves of Sam Neua under the heavy US bombing of the "Barrel Roll" program. What the International Commission called the "Fighting Units of the Pathet Lao" was called by themselves the Lao People's Liberation Army (Kongthap Potpoi Pasason Lao). The Pathet Lao troops were estimated at about 250 in 1953, 6000 in 1957, 20,000 in 1964, 48,000 in 1970, and then down to 35,000 in 1972, reflecting casualties during that previous period. The North Vietnamese, who did most of the heavy fighting in Laos, used the Pathet Lao extensively as guides, guards, and auxiliaries. Individual North Vietnamese POW's described the Pathet Lao soldiers disparagingly as lax and unable to shoot straight. But, as policy, the North Vietnamese did try hard to build the Pathet Lao regulars, regional units, and militia into an autonomous force capable of doing their own revolutionary tasks. While the Pathet Lao perhaps compared favorably with the Royal Lao Army, the intensive North Vietnamese advisory effort did not make them an impressive force. They were taught, however, to goose step in parades, Soviet-style. Their uniforms were baggy green fatigues without rank insignia and, on more formal occasions, peaked caps with a round badge of red-blue-red stripes with a white sun and gold trim. Laos had become, by 1963, a full adjunct of the war in Vietnam. Paralleling the situation in Vietnam, the Royal Lao government and the Pathet Lao on February 21, 1973 signed an "Agreement on the Restoration of Peace and Reconciliation in Laos." This established a "Joint National Political Council" and "Provisional Government of National Union" composed of the "Vientiane Government" and the "Patriotic Forces." It also provided for a ceasefire and exchange of prisoners. In May 1975, with the fall of the Republic of Vietnam, and amid ominous local indications, the conservative leadership realized they were finished, and many fled across the Mekong to refuge in Thailand. 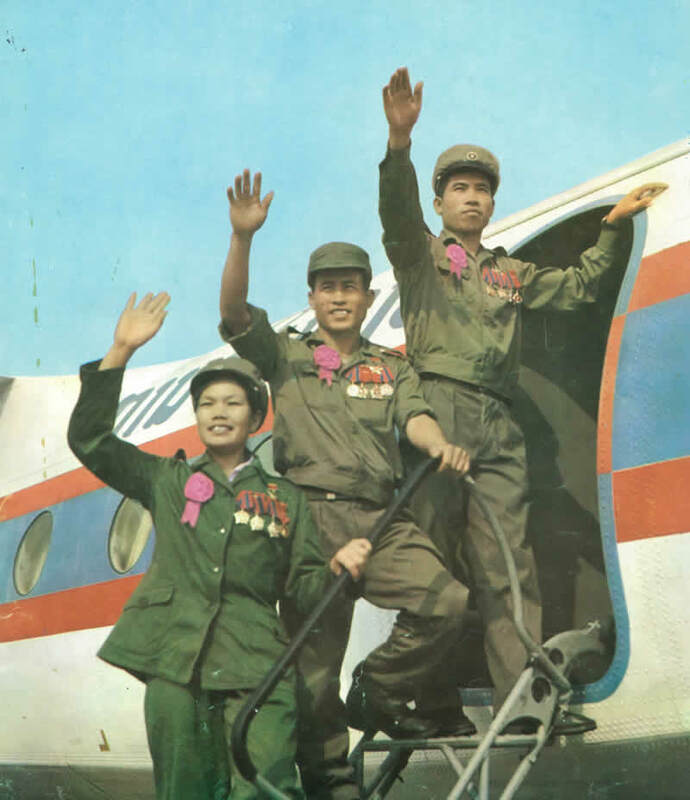 The National Congress of People's Representatives on December 2, 1975 abolished the monarchy and established the Lao People's Democratic Republic. It is ruled by the Politburo of the Central Committee of the renamed Lao People's Revolutionary Party. The somewhat feckless government signed a 25 year "friendship treaty" with Vietnam, while remaining dependent on a continuing heavy presence of the People's Army of Vietnam. Over the years the government, despite continued resistance mainly from minority peoples, became more established and more tolerant, reflecting Lao ways and the evolution of communism also elsewhere. The PAVN largely left. Relations with Thailand were long sour, particularly after Lao units defeated Thai forces in a battle in 1987-88 over border villages. Thereafter relations improved as the Thai government, once the suzerain of Laos, turned towards a policy of trade and inclusion of Laos into the Thai economic sphere. The change towards friendly relations was indicated by the presentation in 1991 to Thai Princess Sirindhorn of Laos' highest award given to foreigners, the Medal of Honor.